This is a good MBA project report on Mcdonald’s. 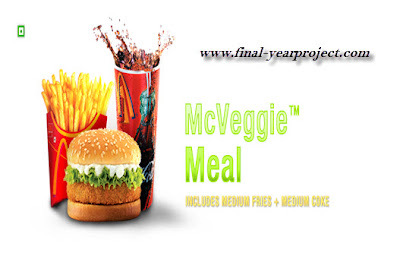 The report start with the introduction and history of McDonald and there venture in India. Mcdonald’s India is a joint venture company managed by Indians. Mcdonald’s USA, has expanded its presence in India via 2 joint venture companies- Connaught plaza restaurant and Hardcastel restaurants. Mcdonalds in corporate India is also associated with the excellent in supply chain management You can also Subscribe to FINAL YEAR PROJECT'S by Email for more such projects and seminar. Mcdonald’s India is an employer of opportunities, providing quality employment and long term careers to the Indian people. The average Mcdonald’s restaurants employees more than 100 people in 25 different position-from cashiers to restaurants managers. Report also includes questionnaire.